Sika deer are originally from Asia and were introduced to the North Island of New Zealand at the start of last century. These aggressive and sometimes very elusive deer will test the hunter’s skill and determination. Bag an 8 point sika during the rut and you have achieved a milestone in your hunting career. The roar or rut occurs between early April and June. Sika are very vocal during the rut, their mating call is not unlike the bugle of an elk. 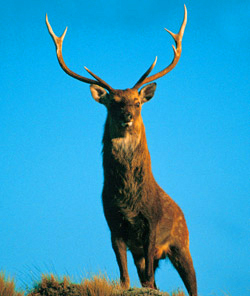 New Zealand Trophy Hunting offers both free range and estate hunting. The sambar deer is originally from South East Asia. It is a large bodied deer, with a mature male weighing up to 300 kilograms (700 pounds). 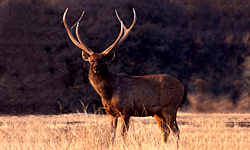 The typical sambar antlers feature six strong tines and are usually heavily pearled. The sambar is an outstanding game animal and one of the hardest deer to hunt. In New Zealand these deer can only be found in the North Island. The New Zealand trophies are the largest in the South Pacific. In 1992 NZTHL client Mike Warn harvested a new #1 world record. We offer our clients free range and estate hunts for sambar in both New Zealand and Australia. The rusa deer found in New Zealand are the Javan rusa. A large male weighs up to 135 kilograms (300 pound). Rusa can be hunted in the North Island of New Zealand, New Caledonia or in Australia. Rusa rut around July and August; during this time they are very vocal and males fight vigorously. The typical rusa antler configuration is 6 points with outer tops longer than inners. New Caledonian rusa are gaining prominence for their large trophy size. New Caledonia and Australia make for pleasant stop-overs on the journey down to the South Pacific. New Zealand’s whitetail originated from New Hampshire in 1905. Two wild populations exist on Stewart Island and near Queenstown. The New Zealand trophies are not large by North American standards, with an excellent trophy being 100-120 SCI points. 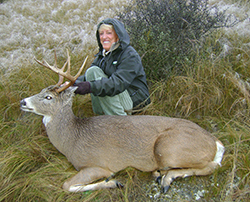 NZTHL offers free range and estate hunts for whitetail. The rut is in April to May.